Cobra warriors: technologically enhanced human warriors designed to combat an implacable alien menace. Now, and not for the first time, the Cobras are facing trouble from their own kind. 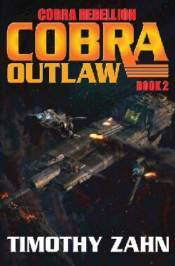 The Broom clan of Cobra warriors finds itself pressed between two star empires headed for war. On the planet Aventine, the Broom's homeworld,pater familia Paul Broom has been taken prisoner by Commodore Santeros, an implacable operative of the Dominion of Man. Paul is due to have his memories sifted through by the dreaded and often destructive Dominion MindsEye in order to root out the location of legendary Qasamaa planet where huge advances in military hardware, particularly a svelte powered armor, might give the Dominion of Man an edge in a coming war with the alien Troft. Santeros hopes to strike a deal with Qasama and, if a deal cannot be struck, then Santores and the Dominion are prepared to take what they want. Elsewhere on Aventine and in the galaxy beyond, rebellion is brewing against Dominion atrocities and Dominion scheming, with outlaw Cobra warriors Lorne and Jody Broom in the vanguard. Meanwhile, Cobra Jason Broom poses as an escaped slave on a secret Troft prison planet where humans are sent to gladiatorial combat to the death for Troft amusement and wagering. He is seeking information on Troft factions, for not every Troft wants war with humankind, and if he can identify moderate elements, he may save the Cobra worlds, and head off a massive interstellar war in the bargain. The stage is set for adventure with one family of Cobra heroes once again fighting for freedom and peace in a galaxy on the edge of war.